My husband got it in his head to plant turnips this year. They all disappeared except one, which became a monster. I kid you not, it weighed about 4 pounds when we finally dug it up last week. Luckily, my friend Jan served this wonderful soup a couple of months ago when she hosted our regular canasta game, and I took the recipe. I had to buy the leeks, but I had plenty of kale in my garden too! This is a rather time-intensive recipe, because there are a lot of veggies that need washing and/or peeling and chopping, and then you have to prepare the walnuts and kale while the soup is cooking. But the end result is delicious, and as you can see, fancy enough to serve at a meal where you want to impress. 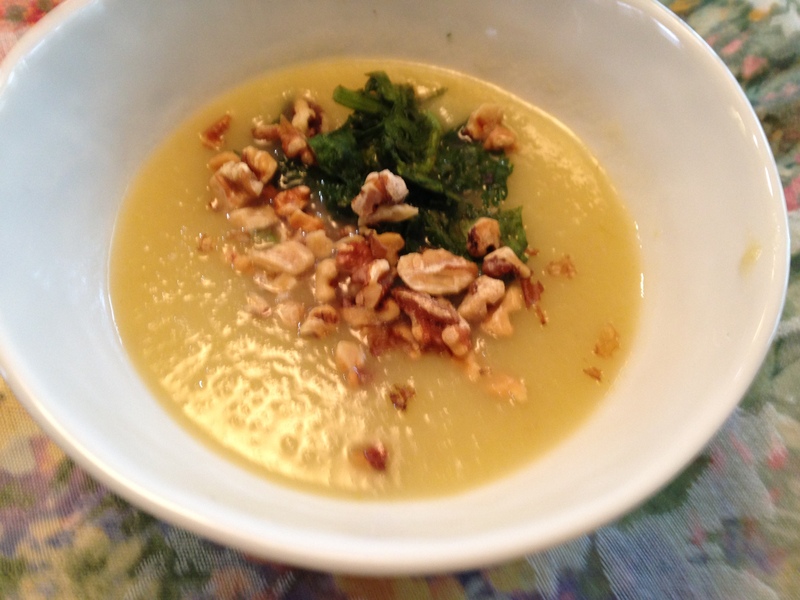 The contrast between the silky-smooth pureed soup and the crunchy roasted walnuts is intriguing. I bought a bunch of three large leeks and didn’t even bother to weigh them; I wouldn’t worry too much about having exactly a half-pound. I didn’t have walnut oil so I used olive oil to mix with the kale. Walnut oil would probably add some flavor, but you don’t need to reject this recipe if you don’t have it. Heat the olive oil in a large, heavy soup pot or Dutch oven over medium heat and add the onion. Cook, stirring until tender, about 4 or 5 minutes. Add the leeks and continue to cook, stirring, until they begin to soften, about 3 minutes. Stir in the garlic and cook, stirring, until the garlic smells fragrant, 30 seconds to one minute. Add turnips, potatoes or rice, water or stock, bay leaf and salt, and bring to a boil. Reduce the heat, cover and simmer 45 minutes to an hour. The turnips should be very tender. Remove the bay leaf. While the soup is simmering, blanch the kale in boiling, salted water until tender, 1-1/2 to mines, or steam for about 3 minutes. Transfer to a bowl of cold water, drain and squeeze out excess water. Slice the kale into thin slivers and toss with the walnut oil. Using an immersion blender, or in batches in a regular blender, puree the soup. Strain the soup to remove any fibers from the turnip and return to the pot. Heat through, stirring, and season to taste with salt and pepper. Ladle into bowls and top each serving with a spoonful of greens and a sprinkling of walnuts. This is a terrific and easy dessert recipe — and it’s gluten-free! I don’t need to make anything gluten-free, specifically, but this is such a good recipe that I use it anyway. It came from Bread and Wine, a book of food-related essays and recipes by Shauna Niequist. You can use almost any fruit or berry. I made it a few weeks ago using serviceberries, which grow on an ornamental tree in my front garden. Serviceberries are like blueberries but a little smaller and less juicy, so you need less cornstarch. If you don’t have almond meal and don’t care about it being gluten-free, substitute all-purpose flour for the almond meal. Preheat oven to 350 degrees and butter an 8×8 (or similar size) baking dish. Mix fruit with sugar and cornstarch. Place in the dish and spread until flat. Place the crisp ingredients in a mixing bowl and mix with your hands until all of the butter is evenly distributed. Sprinkle the crisp mix evenly on top of the fruit. 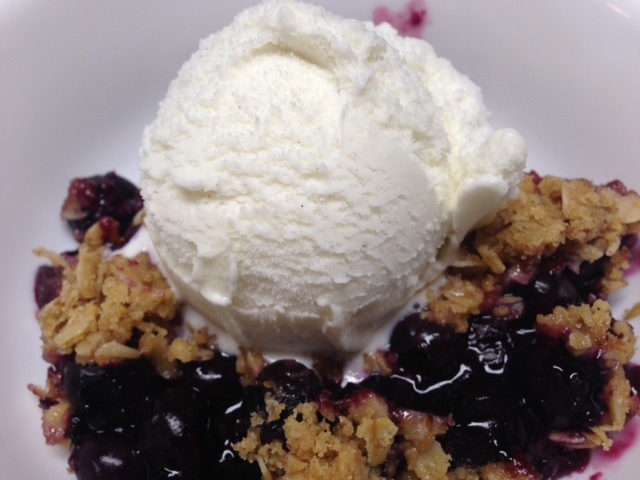 Serve with a dollop of whipped cream or a scoop of ice cream if you like! We’ve had a cherry tree in our yard for at least 20 years, but we rarely get to enjoy the fruit. In the past, many of the cherries were infested with fruit fly larvae, which looked like tiny white worms. I discovered this when, after I pitted a large quantity of cherries in preparation for making a pie, I noticed the bowl of fruit moving on its own. YUCK! I had to throw away the whole bowlful. In subsequent years I would inspect every cherry carefully as I pitted it and had to throw away half or more because of the worms. Last year, because of a late frost, our tree produced not a single cherry. This year, for whatever reason, the fruit flies had pity on us. A few cherries were infested, but many fewer than in the past. I was able to pick more than three quarts of cherries. 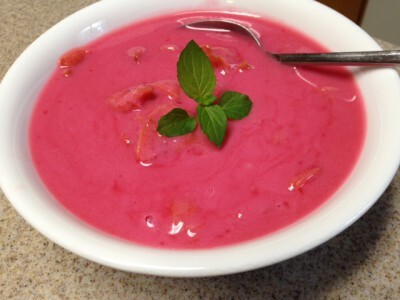 I gave one to a friend in exchange for a bunch of rhubarb from his garden, I froze one, and I used the rest to make this super soup. You can use plain Greek yogurt instead of the sour cream. When I made it a few weeks ago, all I had was vanilla Greek yogurt, so I used that and reduced the amount of sugar a little bit. In a large saucepan, cook cherries with water and sugar until cherries are soft, about 10 minutes. In a medium bowl, mix sour cream with flour, salt and confectioners’ sugar until smooth. Add about a half-cup of the hot cherry liquid to the sour cream mixture and whisk until smooth. Slowly add the sour cream mixture to the saucepan with the cherries, and stir or whisk until the liquid is smooth. Simmer for 5 minutes but don’t boil. Cool to room temperature. Place plastic wrap directly on the surface of the soup so that a skin doesn’t form and refrigerate at least one hour. Serve cold as a first course or as a dessert. You may want to add a dollop of sour cream or whipped cream.